We are currently still conducting an excavation on a site at the Flagstaff House complex, in the old garrison at Colchester and just up the road from our building, Roman Circus House. This is a very limited excavation: we are excavating the service trench for the new residential development at Flagstaff House across the site of the Roman circus. Other than this work, the circus site here will not be affected by the development. The circus site will, however, be included in the development as an open space. We have uncovered part of the foundation of the outer wall of the circus cavea (seating-stand) and parts of two buttresses, as well as part of a robber-trench which represents the foundation of the inner wall of the cavea. 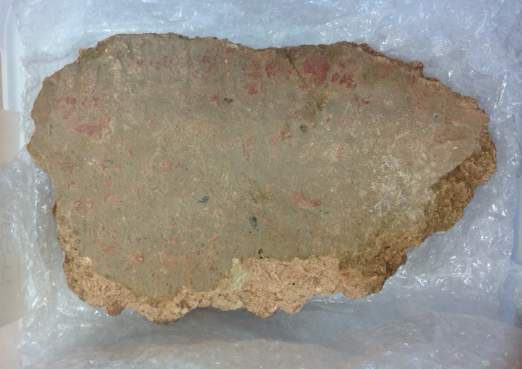 Early last week, we found a very interesting fragment of the circus – this was a large chunk of pink opus signinum with a curved surface, and it is about 30 cm wide. It shows traces of high-quality, dark red paint and is inscribed with a partial graffito. The opus signinum seems to derive from part of one of the cones of the far turning-post or from the coping along the top of the front wall of the seating-stand, along the side of the arena. The curve of the chunk indicates that, if it was part of a column, then it would have been about 1 metre in diameter. The graffito looks like a set of numerals, and we have sent an image of it to Roman inscriptions expert Roger Tomlinson to interpret for us. This is a very interesting find and it seems to suggest that there was a lot of graffiti on the structures of the circus. The Colosseum, the great amphitheatre in Rome, is currently undergoing a major programme of restoration. Interestingly, in January 2015, some red-painted letters and numbers were uncovered over the public entrances at the Colosseum. The Colosseum could seat 5,000 spectators and it had 76 public entrances and four special entrances: admission was usually free, but the spectators were issued with tickets and had to conform to the seating-plan, by which the tiered seats were allocated by status. Evidence of coloured plaster has also been uncovered in part of the Colosseum, and the statues would all have been painted in bright colours. Read more at www.smithsonianmag.com/smart-news/please-find-your-seats-evidence-seating-plan-discovered-colosseum-180954023/?no-ist . The site is being supervised by Trust archaeologist Mark Baister. The images show the fragment of opus signinum (with graffito on the upper edge) and a rubbing of the graffito.